We're only supposed to post twice a day this week to help out our tech-team as they move everything from this hosting site to to the new website, but we felt we absolutely had to make this one-half of our posts today. Remember how we posted a few weeks ago that part of the border fence in Arizona had been built into Mexico? And that it would cost up to $3.5 million to fix? 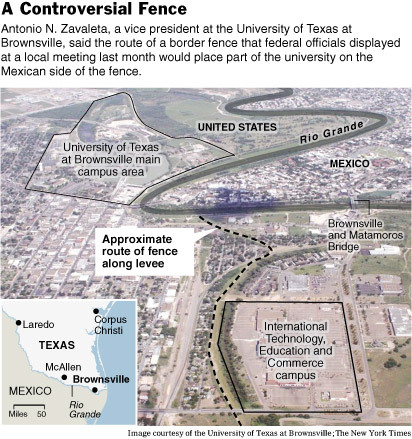 Well, here's something that passed under our radar last month: the Department of Homeland Security planned to build the fence through the University of Texas at Brownville's campus, leaving its International Technology, Education and Commerce campus south of the border. "What about traffic between classes, [the president of the university] wondered. 'Would the students need to show a passport?'" No surprise, no surprise. Ah.